FROM FERGUSON ACROSS THE POLICE STATES OF AMERICA: Police-released videos and individual photos of people re-appropriating the wealth in a Ferguson, MO store after a grand jury refused to indict killer cop Darren Wilson are spanning the globe as far as the United Kingdom. Many media outlets are advising people to call police if they know any of the individuals portrayed, and advertising a $1,000 reward for a successful arrest. ‘I’m thinking that everybody should be held accountable for their actions,” the owner of the Dellwood Market, Jan LaLani, shown in the Fox News video above, says. What about holding police accountable for the murders of thousands of Black and Latino men and women, many of them youth, escalating every day? 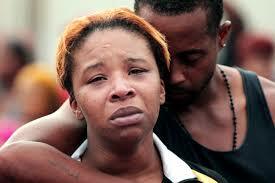 Mike Brown’s mother Lesley McSpadden is comforted by her husband, Louis Head, the day her son was killed. 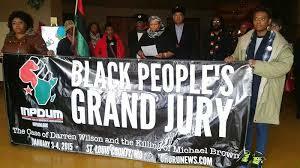 VOD reported: “In the wake of the outrageous grand jury decisions in the murders of Michael Brown and Eric Garner, St. Louis-area police are pursuing charges not only against Brown’s family, but against dozens who participated in rebellions against his murder and the grand jury decision. 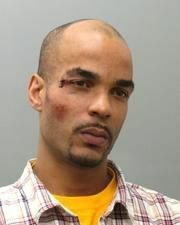 “They include three young men charged with throwing items at police (photo below) another man, Nicholas Green, charged with interfering with police radio dispatches, who was beaten up during his arrest, and at least 24 others. Meanwhile, Fox News reports in the video above that the Justice Department will not likely go forward with civil rights charges against Officer Darren Wilson for slaughtering Michael Brown. If there has been any doubt about the type of regime running this country, it must now be laid to rest, permanently. Property owned by a man who is not among the majority population of the community is being held sacrosanct, while the precious lives of Mike Brown and hundreds of other people of color and poor people, particularly the youth, are being taken at an unbridled pace, with no punishment for the perpetrators. It is time for a new movement. Those who have divided the movement so far by insisting on “peaceful protests” must desist. Demand that Darren Wilson and the armies of police occupying the nation’s communities be “peaceful” first. “While youth are organizing and pursuing peaceful protest they are neither in a compliant mood nor in a mood to capitulate,” Final Call editor Richard Muhammad said in an earlier article on #Ferguson October. Interview with Robert F. Williams (Feb. 26, 1925-Oct. 15, 1996), president of the Union County branch of the National Association for the Advancement of Colored People (NAACP), Monroe, N. C., 1959. Video courtesy of Prelinger Films, published on YouTube March, 2009 by noted historian Paul Lee. For Lee’s full commentary on Williams, click on Interview with Robert F Williams. A Black People’s Grand Jury in St. Louis, Missouri, this weekend delivered a “true bill of indictment” for first degree murder against former Ferguson police officer Darren Wilson in the death of Black teenager Michael Brown. Black people “can and must take matters into our own hands,” said Omali Yeshitela, one of four prosecutors that presented evidence, not only of Wilson’s personal guilt, but the institutional culpability of the entire regional criminal justice system in the murder and subsequent whitewash of the crime. 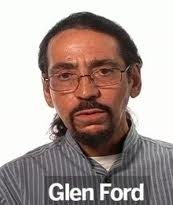 The Black People’s Grand Jury also heard testimony from local residents with personal knowledge of police behavior in the region, including Black former police officers – a method of truth-seeking grounded in the logic that the most “expert” witnesses on institutional racism are its victims, who have experienced the phenomenon in all its dimensions. At root, the Black People’s Grand Jury is an exercise in self-determination, a collective response to a collective assault on a people that have been criminalized by the Mass Black Incarceration State. “We cannot trust our children, the future of our community, in the hands of this establishment that has proven to us over and over again its disregard for black life,” said Yeshitela, whose International People’s Democratic Uhuru Movement teamed with local Black organizations to convene the proceedings. 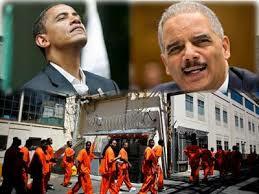 Obama and Holder ignore Mass Black Incarceration State. Most importantly, the Black People’s Grand Jury model is easily replicable throughout the U.S., just as the Mass Black Incarceration State operates in near-uniform fashion in every precinct of the country. North, South, East and West, whether the Black population is relatively large or small, the State’s mission is to contain, control, terrorize and criminalize Black people, and to incarcerate them in enormous numbers. The St. Louis model, and longer-form variations on the theme, such as Black People’s Boards of Inquiry, can go far towards exposing and deconstructing the police/prison regime that over the past two generations has killed innumerable Michael Browns and spawned a gulag so huge and so disproportionately Black that one out of every eight prison inmates on the planet is an African American. 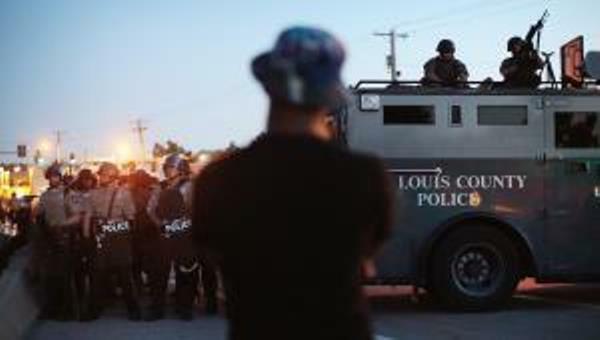 Militarized police patrol streets of Ferguson after Michael Brown’s murder. It is an inherently militarized system of counterinsurgency that begins with hyper-surveillance of Black communities and ultimately warps every aspect of Black internal and external social relations. Inevitably, the white supremacist, profoundly anti-democratic and ultimately lawless nature of the U.S. police-prison mission has facilitated the rise of the national security state and the general degradation of bourgeois liberties for all Americans – a strong basis for building multi-racial alliances. 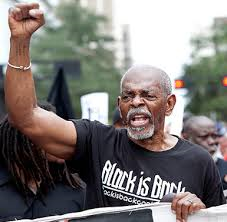 However, African American resistance to the Black Mass Incarceration State, in all its manifestations, must be rooted in the struggle for self-determination – freedom on our own terms, which is inseparable from demands for justice. Black People’s Grand Juries can be part of the process of building local self-determinationist institutions of resistance to the ruling order, particularly in bolstering demands for genuine community control of police. For these reasons, the model can help prevent Black people’s righteous anger and energies from being dissipated by diversions concocted by the matrix of elected officials, their appointees and commissions, along with the Black misleaders and accommodationists who act as agents of the Democratic Party and the rich. The steady drumbeat of protest must be accompanied by institution-building projects aimed at dismantling the Mass Black Incarceration State – the transformational task of the current movement. 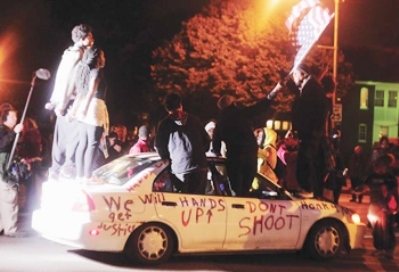 This entry was posted in Uncategorized and tagged Ferguson, FergusonOctober. Bookmark the permalink.